Stems: Erect, simple or sparingly branched, glabrous to sparsely soft-hairy; internodes as long or longer than subtending leaves. Leaves: Opposite, ovate to ovate-lanceolate, 1.6 to 3.6 inches long, .4 to 1.2 inch wide, dotted, glabrous or rarely soft-hairy; margins toothed or entire, fringed; tip tapering to point; stalk to 1/5 inch long; lower leaves often shorter and wider than upper leaves. Inflorescences: Heads, solitary, terminal; bracts ovate-lanceolate to linear-lanceolate, 2/5 to 4/5 inch long, 1/8 to 1/2 inch wide, green or purplish, spreading or bent downward; tips narrowly pointed; margins entire, fringed. Flowers: Calyx tubular, curved, 5-toothed, 1/4 to 1/2 inch long, mostly glabrous outside, stiff-hairy in throat; corolla 2-lipped, 1 to 1.5 inch long, white or pale rose-purple, lightly pubescent outside; upper lip erect, sickle-shaped, bearded inside near tip; lower lip purple-dotted, 3-lobed, middle lobe narrow, upturned; stamens 2, conspicuously protruding from under upper lip. Fruits: Nutlets, 4,rounded at tip, pointed at base, smooth, brown, each 1-seeded. Habitat: Rocky, wooded hillsides and thickets. Uses: The leaves are sometimes used to prepare a tea. Comments: Named for John Bradbury, a botanical explorer in the Mississippi Valley region. 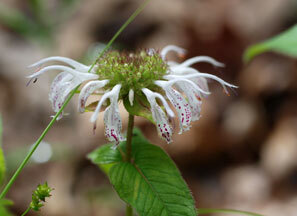 Bradbury beebalm is pollinated by bees and butterflies.